When it comes to the end of the meal, how do you tempt your guests to indulge in that extra course? Chocolate and pâtisserie has never been more inventive or visually more arresting, so it’s the ideal way to express your creativity, whether that’s through using pre-made pastry and adding a final flourish, or from presenting refined designs that nod to the latest trends. Whatever you choose, there’s a host of products out there to help you create pastry and chocolate perfection. Claire Clark, pastry chef, consultant, author and co-director with Sarah Crouchman of pâtisserie catering service Pretty Sweet, uses British-produced chocolate from Pump Street Bakery, such as its Honduras Bread & Butter, a 58% milk chocolate, and its Rye Crumb, Milk & Sea Salt, a 60% dark milk chocolate. “They are both super-creamy and luxurious and the chocolate has been well received as the trend is to buy British or local,” says Crouchman. Marie-Emmanuelle Chessé, international development project manager at French food producer Tipiak, which supplies frozen, hand-finished French pâtisserie to the UK foodservice sector, says there continues to be a high demand for gluten-free items. “Demand for Tipiak macarons in the UK soared by more than 24% last year. All Tipiak macarons have the bonus of being suitable for vegetarians and certified gluten-free by the French Association of Gluten Intolerance, so they appeal to those with a range of dietary requirements,” she says. There’s more free-from advice from Alasdair Beach, kitchen operations manager for Company of Cooks at the Hayward Gallery café at the South Bank Centre in London. “We are seeing more and more consumers asking for free-from options to help meet their dietary needs and we’ve found real success through the likes of vegan cakes,” he says. Beach sees the free-from trend as an opportunity to think creatively to ensure chocolate and pâtisserie can be enjoyed by all and has turned to recipes that are free-from by design. For example, at the Hayward Gallery café, one of the most popular chocolate options is based on a Scandinavian Kladdkaka cake. Made with eggs, ground almonds and cocoa powder, Kladdkaka is a gooey gluten-free cake similar to a brownie. A little sea salt is added to offset the sweetness and it’s topped with poppy seeds to add texture and a slight nuttiness. “It also ties in perfectly with the trend for all things Scandi, Nordic and hygge,” adds Beach. In 2017, French chocolate manufacturer Valrhona introduced the first range of fruit couvertures, called Inspiration, to the UK. The process involves blending chocolate and fruit or nuts, to produce a combination of the two perfect for creating new pâtisserie. The couvertures come in strawberry, passion fruit and almond flavours, with no artificial colouring, artificial flavours or preservatives. Although Pretty Sweet offers a bespoke pâtisserie service, sometimes the team simply doesn’t have the time to make pastry from scratch when producing large quantities. Pidy also supplies a ready-made éclair shell, which, Pidy UK’s Levet says: “provides the perfect opportunity to get creative with flavours and fillings, offering chefs even more opportunity to be adventurous in the kitchen. Savoury éclairs are less traditional but equally delicious and worth exploring. Zareen Deboo, foodservice channel operations manager at Ferrero UK & Ireland, suggests that operators look for ways to incorporate chocolate into their products, to give that luxurious edge. “Thornton’s luxury chocolate flakes can be used as a decoration or as part of a buttercream on a cake, melted to create a chocolate ganache for chocolate tarts and even tempered to glaze éclairs,” he says. Chocolate is also used in wholesaler Mevalco’s figs coated with a dark chocolate ganache. David Menendez, managing director of Mevalco, recommends the traditional Spanish snack-dessert of churros. 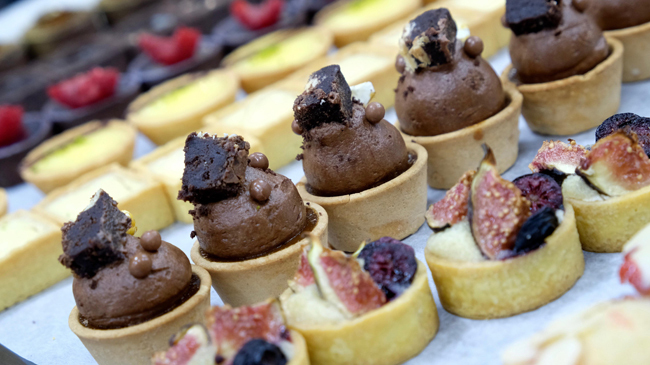 Anna Sentance, gourmet marketing manager for Callebaut UK and Ireland, points to research that suggests that 34% of consumers would be more likely to order dessert if a smaller portion were available. Additionally, Technomic’s Dessert Consumer Trend report says that family-style dining and customisation are huge trends for the summer, shaping the style of dishes and the way they are served. “Offering a small dessert is a good way to cater for this growing trend,” says Sentance. “For example, dough balls served with Callebaut Belgian chocolate sauce can be offered in portions of four or eight. A small portion of cheesecake can be up-sold to create a dessert platter. Sarah Frankland, head pastry chef at Pennyhill Park in Bagshot, Surrey, and a 2012 Acorn Award winner, says although Valentine’s and Easter are big sale periods for chocolate-based products, her guests love chocolate all year round. “I think the key to keeping people’s interest is creating, producing and maintaining desserts to a high standard: taking fresh flavours from the seasons to keep desserts exciting and new. At Pennyhill Park, 65% of all dessert sales are chocolate-based, which means we generally try and weigh the menu in favour of chocolate. Frankland believes there are important rules to follow with dessert recipe creation, and the first is seasoning: “This often gets overlooked in the pastry kitchen and great dessert should be seasoned to invigorate every area of taste: salt, sweet, bitter, sour and umami. “The second area is food lifestyle, be it veganism, gluten-free, etc. I’m a big advocate for ensuring that everyone has a great dessert experience, and a big focus for me is ensuring that we are developing high-quality, tasty menus for vegans and gluten-free guests.